Definition at line 358 of file MachineFunction.h. 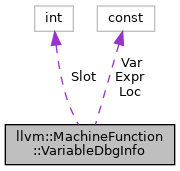 Definition at line 365 of file MachineFunction.h. Definition at line 360 of file MachineFunction.h. Definition at line 363 of file MachineFunction.h. Definition at line 362 of file MachineFunction.h. Definition at line 359 of file MachineFunction.h.